At Outskirts Press, Inc., we take great pride in celebrating the work of our successful self-publishing authors, and we do so each week through our Self-Publishing Author Spotlight. This week we highlight self-publishing author Kimberlie D. Richardson, who has published two successful titles with Outskirts Press. Learn more about Kimberlie through this week’s Self-Publishing Author Spotlight. Kimberlie D. Richardson is the daughter of the late Dr. David C. Cozart and Gloria J. Carter-Cozart. She was raised in Spring Valley, New York and resides in Baltimore, Maryland. She graduated from Morgan State University with a Bachelor of Science Degree in Counseling Psychology and a Master of Arts Degree in Counseling Psychology from Bowie State University. 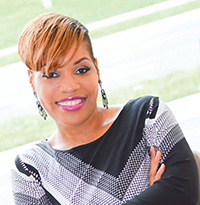 Kimberlie is currently a Professional School Counselor within Baltimore City Schools. Not only is she an aspiring author but she is also the Writer, Director and Producer of the movie When Grandma Prays. She and her husband, Lawrence G. Richardson, have been pastoring Living Waters Ministries in Towson, Maryland since 1998. Together they are the proud parents of two wonderful sons, Malachi and Isaiah Richardson. Love can be so complicated and I’m tired of crying while trying to figure it all out. He loves me… He loves me not is something that I often ponder. But the answer is never the same. I find myself falling in and out of love with guys who I’m not sure even know what love really means. Honestly, I guess I’m trying to figure it out as well. All I know is that I’m stuck between loving someone and being loved by someone else. Little Charlie and the Christmas Tree is a story about a little boy who learned the importance of sharing and being considerate of others. Most importantly, he was reminded that Christmas is not just about giving and receiving gifts. But it’s about the celebration of the GREATEST GIFT, the GIFT of JESUS CHRIST. Next Next post: Live Well, Write Well, & Publish Well…ness Related Books!